Supportive of the idea that baseball should be added back to the Olympic program. After 15 years as a vice president of Major League Baseball, Rob Manfred will take over in January as commissioner for long-serving chief Bud Selig, recently signing a five-year contract for the job. 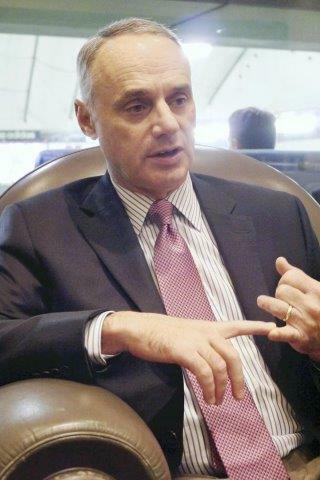 The 55-year-old Manfred has been at the forefront of MLB’s explosive growth in revenues and attendance, while trying to attract a new generation of fans. Here are some excerpts from a recent interview on a number of topics during the MLB-Japan All-Star series. Q: What is the significance of playing MLB games in Japan? We think that it’s very important for fans to have an opportunity to see our product live. It really is the best vehicle that we have for the internationalization of the game. It’s particularly true in Japan, because the baseball has become so competitive. The Japanese teams have become so strong now, you get a very competitive series when we come here. Q: In 2012, the Athletics and Mariners opened the season in Japan. Do you have plans for the next Opening Series? We had some preliminary conversations today with the NPB about the possibility of an opening series in 2016. We’re excited about the prospect. We hope that that series will come together. I would be remiss if I didn’t say we appreciate the fact that NPB accommodates us from a scheduling perspective — very graciously accommodates us. Q: What teams are you thinking of? Stadiums? We really haven’t had conversations with particular teams about 2016. Fortunately, we have always had a great deal of interest among our teams for coming here to Japan to open the season. They view the trip as an honor, and we always have plenty of teams that are interested in doing it. Q: The Selig era was marked by incredible growth of baseball. What are your expectations for next era? I think in the coming years, you’re going to see significant application of technology to our game. I think that the move to instant replay this past year is the beginning of a trend, during which the game will be modernized, probably changed significantly by technology. You’re not going to change the essential character of the game — the way it’s played — but the things that surround the game. Make sure that the rules are enforced. The entertainment that’s provided to people in the ballpark, the enhancements that’s provided to the broadcasts on television, I think will change greatly in the coming years. Q: Total attendance at MLB games reached 73 million. Do you still lack the younger generations attending games? I think that it’s important for every business to focus on the next generation of customers. It’s not so much that I see a deficiency in the demographics at our games currently, as it is that I recognize with younger people, there are so many entertainment alternatives out there, that we have to work even harder to make sure that we keep the audience. Q: Japan games are considered too long. Do you think MLB needs to speed up the game as well? Mr. Selig has appointed a committee on pace or length of the game. We’ve undertaken a series of experiments in the Arizona Fall League. And I think it is important for Major League Baseball to act aggressively on the issue of pace of game. This is another topic we discussed with the NPB commissioner today. There seems to be a common concern about the length of the game. I do think that the length of the game is particularly an issue in the broadcast space. Q: The next WBC tournament is scheduled for 2017. What is the size of the event expected to be? No decision has been made as to the exact size of the field. We felt that in 2013 the addition of the qualifying round was an important step forward. And I would not be surprised if that qualifying round was expanded. I think that in the core tournament, the 16-team format will stay the same. I think it is likely you will see more than 28 in that larger qualifying pool. Q: Does MLB have any plans to help bring baseball back into the Olympics? Such as sending major leaguers to the Games? We have been supportive of the idea that baseball should be added back to the Olympic program. The timing of the Olympic Games creates very significant issues for us in terms of the interruption of our season. And we have not made a commitment as to the level of participation of our players because baseball currently is not part of the program.